UPDATE: The video and slides from the PRAT Program webinar have been posted. We’re hosting a webinar for potential applicants to the PRAT Program on Tuesday, March 28, from 12:00-1:30 p.m. EDT. PRAT is a three-year program providing outstanding laboratory research experiences in NIH’s Intramural Research Program (IRP), access to NIH’s extensive resources, mentorship, career development activities and networking. The program places special emphasis on training fellows in basic biomedical research areas including cell biology, biophysics, genetics, developmental biology, pharmacology, physiology, biological chemistry, computational biology, immunology, neuroscience, technology development and bioinformatics. The next receipt date for applications is October 3, 2017. Applicants can be graduate students considering postdoctoral research opportunities or postdoctoral fellows with no more than two years of postdoctoral research experience by the time of appointment to the PRAT program (late summer 2018). All applications require connecting with an investigator in the NIH IRP in advance of writing the application. To attend the webinar, join the Skype meeting (link no longer available) shortly before 12:00 p.m. EDT and enter the conference ID 8368072. You can also attend by phone by calling 301-480-4255. Slides will be posted on the PRAT website following the event. We look forward to talking with you about the PRAT Program. Last year, we launched the NIGMS Director’s Early Career Investigator Lecture series. Open to everyone in the scientific community, the lectures are directed at undergraduate students to introduce them to cutting-edge science while inspiring them to pursue biomedical research careers. The series also highlights the achievements of some of NIGMS’ early career grantees. I’m excited to share that the 2017 lecture will be presented by Namandjé Bumpus, Ph.D., associate professor of medicine-division of clinical pharmacology at Johns Hopkins University School of Medicine. Namandjé is an NIGMS-funded recipient of the Presidential Early Career Award for Scientists and Engineers. Her lecture, “Drug Metabolism, Pharmacogenetics and the Quest to Personalize HIV Treatment and Prevention,” will take place on the NIH campus on Wednesday, April 5, from 2:00-3:00 p.m. EDT. It will be videocast and archived on the NIH videocasting site. I’m pleased to announce that NIGMS is the new home for the Science Education Partnership Awards (SEPA). These awards, which were transferred from NIH’s Division of Program Coordination, Planning, and Strategic Initiatives, support research and educational activities that complement other workforce diversity and training programs within NIH mission areas. The change will allow the SEPA program to be better integrated with other NIGMS capacity-building and research training programs and will increase opportunities for synergies between them. The SEPA program promotes partnerships between biomedical and clinical researchers and pre-kindergarten to grade 12 teachers and schools, museums and science centers, and other educational organizations. In addition, the program provides students from underserved communities with opportunities to learn about research careers; supplies teachers with professional development in science content and teaching skills; and improves community health and science literacy through its science centers and museum exhibits. SEPA will be housed in our Center for Research Capacity Building (CRCB), which supports research, research training, faculty development and research infrastructure improvements in states that historically have not received significant levels of research funding from NIH. It also supports faculty research development at institutions that have a historical mission focused on serving students from underrepresented groups. We do not plan to alter the mission or goals of SEPA as a result of the transfer, and the program will continue to be administered by Tony Beck, who has served as its program director since 2001. If you have any questions about the transfer, please contact Tony Beck or Fred Taylor, acting director of CRCB. In addition to the currently active funding opportunity announcement (FOA) for national cryo-electron microscopy (cryo-EM) centers, NIH has issued an FOA for research education program grants for cryo-EM curriculum development. Both FOAs are part of a new NIH/Office of Strategic Coordination Common Fund program being led by NIGMS and the National Eye Institute (NEI). The research education grants will support investigator-driven development and dissemination of online educational materials, such as video-based tutorials, novel self-paced learning approaches and computer-based educational tools, to instruct biomedical researchers in the application of cryo-EM techniques, theory and analysis. Techniques include cryo-EM single particle analysis and cryo-electron tomography. Applications are due by July 25, 2017, with optional letters of intent due one month earlier. If you have questions about the research education grants announcement, please email NEI’s Houmam Araj or call him at 301-451-2020. Please also help us get the word out by letting your community know of this opportunity. NIGMS is committed to ensuring that taxpayers get the best possible returns on their investments in fundamental biomedical research. As part of an NIH-wide commitment to enhancing stewardship, we regularly monitor trends in the Institute’s funding portfolio. One of the most commonly cited metrics when discussing grants is success rate, calculated as the number of applications funded divided by the number of applications reviewed. As shown in Figure 1, the success rate for NIGMS research project grants (RPGs) was 29.6% in Fiscal Year (FY) 2016, the same as it was in FY 2015. Although we funded a record number of competing RPGs in FY 2016, we also received more applications than in FY 2015, leading to a level success rate. The first applications and grants for the Maximizing Investigators’ Research Award (MIRA) (R35) program are included in the FY 2016 RPG counts. The increase in RPG applications in FY 2016 has reversed the downward trend noted in last year’s analysis. Figure 1. 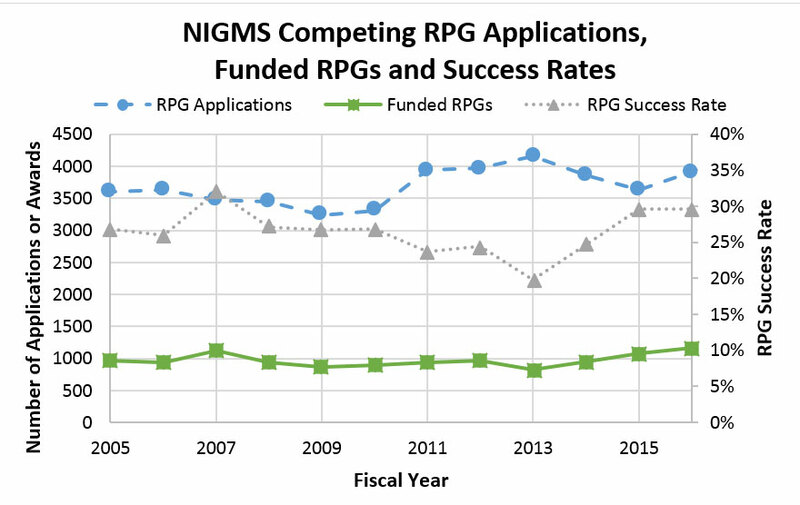 Number of NIGMS Competing RPG Applications, Number of Funded Competing RPGs and Success Rates for RPGs, Fiscal Years 2005-2016. NIGMS RPG applications (blue circles, dashed line; left axis) increased from FY 2015-2016. NIGMS-funded RPGs (green squares, solid line; left axis) also increased from FY 2015-2016. Consequently, the NIGMS RPG success rate (gray triangles, dotted line; right axis) remained unchanged from FY 2015. The dip in success rate in FY 2013 was due in part to the budget sequester. UPDATE: The new predoctoral T32 funding opportunity announcement specifically tailored for predoctoral graduate programs in the basic biomedical sciences is now available. The NIGMS T32 presentation at the January 2017 Advisory Council meeting begins at 1:43:07. The intention is not to layer additional activities onto existing structures. Instead, this funding announcement is designed to allow for a creative reinvention of biomedical graduate education that preserves the best elements, while enhancing the focus on the development of research and professional skills by trainees. We expect to issue the new T32 FOA this fall and to receive the first applications in May 2018. The new FOA will apply to all NIGMS predoctoral T32 training grants, except for the Medical Scientist Training Program (MSTP), which will remain on the parent T32 announcement for now. We plan in the future to develop a parallel FOA that is specific for the goals of the MSTP. We encourage the community to watch the presentation at our Council meeting and view the slide deck. As always, we welcome your input and feedback on these plans. You can post your comments below.